Well, our knowledge of the origins of milk has been put out to pasteurise. It turns out that it doesn't just come from mammals; it's also a resource that swirls around deep inside Earth, as precious as – but presumably twice as tasty as – oil. 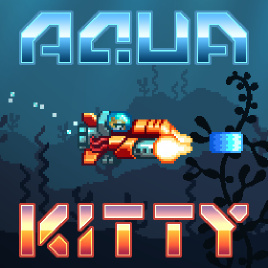 Aqua Kitty: Milk Mine Defender has you descend deep below the sea to defend the brave felines that mine the calcium-rich liquid and may explain why cats detest water: it gets between them and their milk, silly. 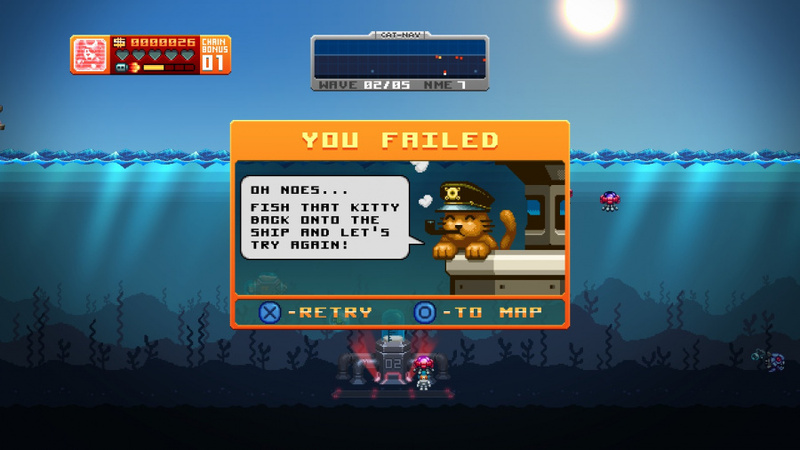 A cast iron combination of lolcats and horizontal bullet hell shooter, Aqua Kitty: Milk Mine Defender sits your moggie in a submarine with one task: protect the milk pumps. Swarms of robotic fish rampage about the ocean, arriving in waves to spit out glowing bullets, while jellyfish-alikes try to steal away the kittens manning the milk mines. The aim of each level is to eliminate every enemy on the map without losing all of your co-workers – while surviving yourself, naturally. Aqua Kitty weans you in quite gently, only asking you to defend a single mine against a small school initially. The first stages, though only short in length, give you adequate time to get used to the simple controls. The analogue stick or D-Pad moves your sub about, Cross fires your laser, Circle unleashes a more powerful strike that's bound to an energy meter that depletes rapidly. It's possible to give your thumb a rest by setting your ship to auto-fire too. Most interesting is the way that turning is handled: you flip which direction you're facing with clicks of the shoulder buttons. It's a great decision which affords you better manoeuvrability with the analogue stick without fear of turning around by accident. Of course, you move more slowly when gliding backwards, so it's always best to turn and zoom away in the face of a new wave of terror. Levels scroll only horizontally and loop around seamlessly: the only way you can tell that you've exited the right and re-entered the left is by looking at the useful mini-map, which shows the entire width of the seabed and tells you everything you need to know with just a few coloured pixels. You're orange, the milk mines are the bright white spots, standard enemies are pale blue, and the tabby snatchers are as red in dot as they are in full view. It's essential to keep an eye on both the main play area and the mini-map to make sure you don't get caught out. Though it's easy to pick up, conquering Aqua Kitty is about as difficult as getting a house cat to wilfully sniff a lemon. Outside of early battles, you're almost never assured a comfortable victory; you're usually left clawing and biting for your life all the way to the end. 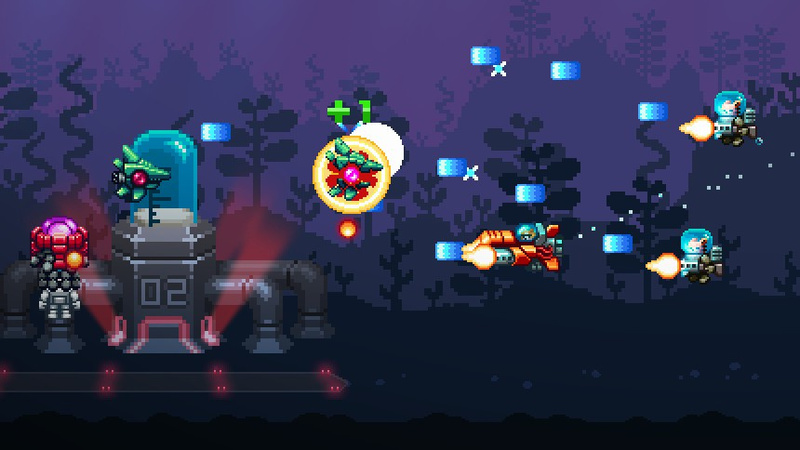 The first enemies you come upon can be dismantled with a couple of hits, but they soon diversify: exploding puffer fish, bullet-sponge batfish, rocket-armed flounders. Fish become relentless, useless alone but devastatingly effective in groups, deadly moving walls that block your way to abort another catnapping effort while firing all manner of bullets and missiles. Take a hit from a projectile or collide with an enemy directly and you lose a heart; considering that they're in short supply, that's to be avoided at all costs. You can recoup health, gain temporary shooting partners or set off a smart bomb if you're lucky enough to shoot down a glowing pod – which can also harm you – but it's best not to rely upon them. That your enhanced laser meter grows more with each passing world is a small comfort, as each area gets increasingly hard to scale along with it. You learn to savour celebration: the further you get, the less common it becomes. Crucially, it's as addictive as it is challenging. It controls very well and any death can be avoided with enough dexterity and attention, though finishing a level with all mines in tact is another question altogether. You can restart a level near instantly, which imbues a dangerous 'just one more go' atmosphere. As well as 21 levels to tame, there's also an endless mode that'll really make your fur stand on end. 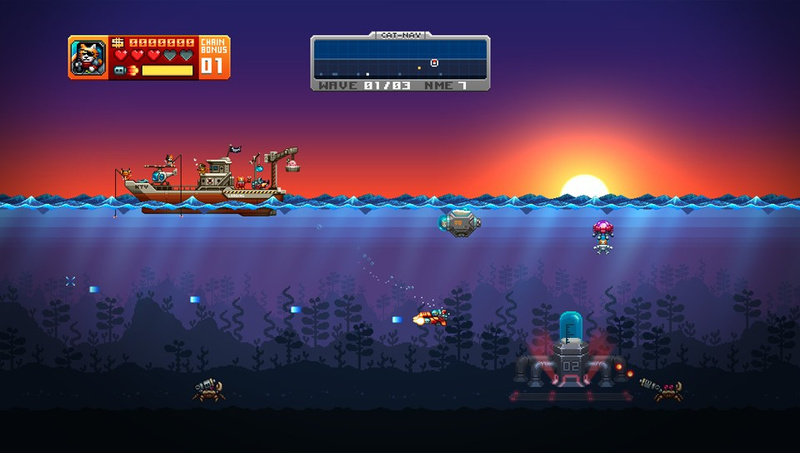 It's a deceptively beautiful game too: what appears to be basic on first glance is actually terrifically detailed pixel art, with tiny bubbles that stream behind your submarine, sloshing waves, and cute little cats in diving suits. The retro theme is backed up by a superb synthesised soundtrack that nods back to the chiptunes of yesteryear. 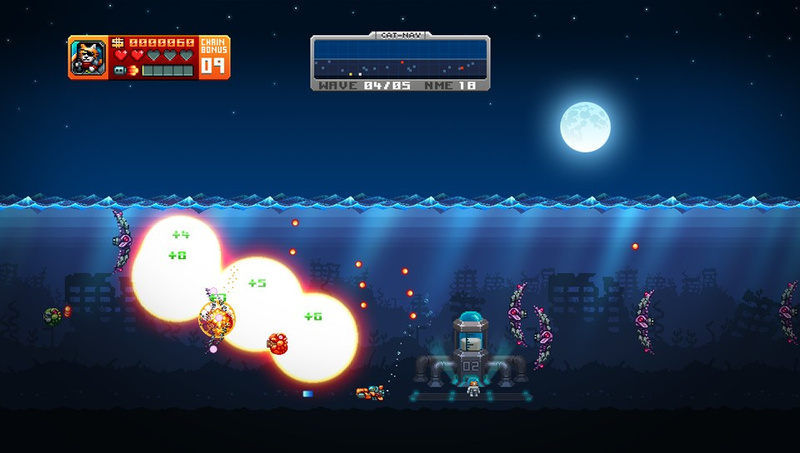 Aqua Kitty: Milk Mine Defender is a fantastic launch title for the PlayStation Mobile platform. It's demanding in its difficulty, which may put some people off, but it can afford to be when it's put together this well on all fronts. Pay the small entry fee and you'll be grinning like the cat who got the cream. What are some upcoming PS Mobile games? Liking the video embedded at the end. Finally getting to play this now thanks to the free Mobile games promotion and I'm really enjoying it. A lot of these Mobile games are highly fun and addictive.